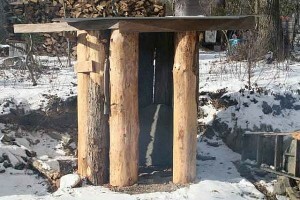 A smoke house is traditionally used to prepare and cure meats long before refrigeration was invented. A smokehouse creates flavorful meats and the different types of wood chips used for smoking creates particular flavors. A smokehouse can be built from cinder blocks and if you are looking for a great burner then check out the Top 10 gas burners here. Before starting your project of building a permanent smoke house, check with local departments about zoning considerations. There may be prerequisites on minimum distance you need to place a smokehouse from designated property line, or the types of materials you will be using to construct it. If you plan on having running water or electric installed in the smoke house, you may need approval from the local law before you can proceed. The type of smokehouse that you build depends on the type of smoking you want. Do you want to do cold smoke or hot smoke? Fish and poultry is normally smoked at 190 degrees to 200 degrees. Meats and cheese are cold smoked at around 90 degrees. Location is another consideration to be taken into. While smoked produced is heavenly to your palette, having a smoke house emit smoke all day into your home may not be a good idea. Nor would your neighbor be particularly pleased if they have to contend with the same. You may want to consider getting a portable smoker that you will be able to move around to prevent the above, but if you plan on building a permanent smokehouse, then this must be given due and proper consideration before you begin building. A smoke house with hooks in the ceiling to suspend hams and slabs of bacon is ideal. You can have removable, thin metal rods that will let you pierce strips of jerky and hang them vertically to dry, and racks at the bottom to dry other produce that did not hang well. 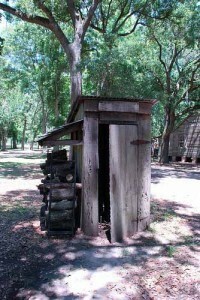 Size is the third consideration when planning on a smokehouse. Ask yourself how much will you be smoking at one given time? Will you be smoking turkeys which are large items or small items like sausage links and cheese? A narrower and taller smokehouse can be constructed if you only want to smoke sausages, while turkeys and roast require a larger floor area in your smoke house. Build the two side panels by assembling the 5 tongue-and-groove boards together, and create a slope on top of these two panels from 6 feet to 5 feet at 9 inches. Mark the slope on each side panel with a chalk-line. Cut the boards to size. Attach 1.5 inch X 1.5 inch board to both front and back of the top and bottom of each panels and hold the 1.5 x 1.5 inch board with deck screws. Then construct the back wall fitting with five 5 feet, 9 inch boards (in step 1) together and brace it with four 1.5 inch by 1.5 inch boards (step 2) along the top and bottom edges. Secure these with deck screws. Attach the back panel to the two side panels with deck screws screwed through the bracing boards. Attach 2 X 4s that has been cut to fit along the bottom and top edges to form the front panel of the smoker house. Attach 1.5 x 1.5 inch boards on either side of the internal structure to act as shelf support and install steel sheeting to create smoke house shelves. Make sure the shelves are level. Attach a sheet steel as a roof to the top edge of the smokehouse with deck screws, making sure that you allow 1/8 inch to ¼ inch of spacing between the roof and top edge. For the door to the smokehouse, brace the remainder 6-foot long tongue-and-groove boards with a Z shape using the remainder 1.5 X 1.5 boards. Attach the door with two 4-inch strap hinges to the smokehouse. Cut a hole about 12 inches up from the bottom of the side panel that will allow you to install a 3 inch double wall heater vent. Place the fire box that will burn the wood chip from outside the house and connect it to the intake vent you cut in step 10. Place the box far enough from the building to warm the building inside to about 90 degrees. Note: Do not use pressure treated wood or galvanized metal in materials used when building a smoke house. Building a smokehouse is not as complicated as most people think. With a little skill with tools and some basic building know-how, you\’re on your way to becoming an owner to a smokehouse that will provide you with delicious tasting smoked meat. This entry was posted in Outdoors on August 16, 2009 by Mike.